Shakira Shakira (that joke never gets old) was “rocking” out at the Live Earth Concert in Germany this past weekend. I don’t get it. I’ve heard a few of Shakira’s songs and I have no idea why she would need to dance like she is in these pictures. Do you really head-bang to “Hips Don’t Lie?” I mean I do, but I’m not normal. I also head-bang to “When the Saint’s Go Marching In.” Do people even say head-bang anymore? Am I 75? Anyway, rumor has it that Shakira will be getting married in the Dominican Republic this coming September. Supposedly fans of Shakira have been waiting for 7 years for Shakira to get married. I have no idea why. 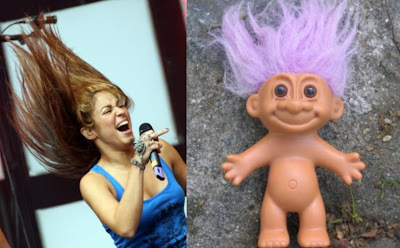 I just thought Shakira looked like a Troll Doll, so I ran with it. Good day.